Yesterday, I posted links to some of the more potent pieces that came my way after the election, and today I’d like to highlight a singular message that arrived in my inbox during that tender time: Born for these times. The author is someone whose voice met me decades ago when, as a new mother, I desperately searched to understand myself and the world through a new lens. Twenty years later, I’ve had the privilege and delight of getting to know Joan Borysenko, personally, in my volunteer role as her program assistant at the Kripalu Center for Yoga and Health, where Joan is a regular and beloved presenter. 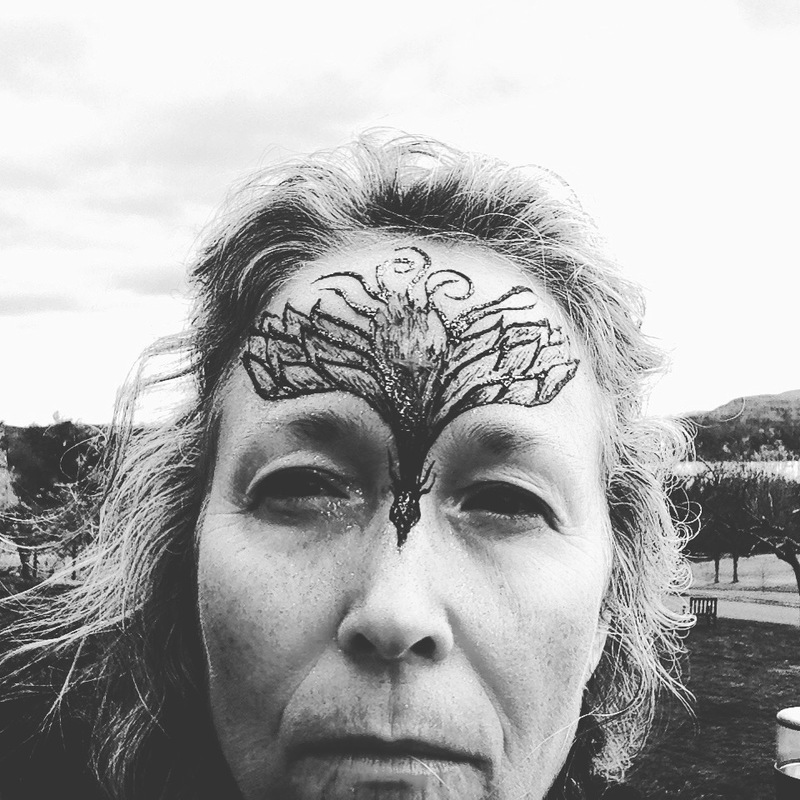 We were together on the weekend leading up to the election when I found myself with the peculiar impulse to have a phoenix painted across my aching forehead. “What happens at Kripalu, stays at Kripalu,” Joan often quips to her program attendees (to great gales of laughter.) And while the glittered paint on my face was temporary, I intended to wear it home, and then committed to wearing it through the election, for purposes I still don’t fully understand. When I woke on 11/9 to the unfathomable, the headache that had plagued me for days was eerily gone. I washed the paint from my face, but left the tattoo and the tears in place. I continue to resonate deeply with this sense that these times require greater collaboration. 2. Liminality– the time between no longer and not yet. The old system is defunct but a new one has not yet emerged. This passage is rife with both danger and opportunity. Some people become depressed and unable to act in liminal time. Others react from their most fearful, angry, survival needs. Still others respond mindfully and appropriately to whatever the moment calls for. Key to mindful action is the ability to calm down the amygdala (the brain center most concerned with negativity) so that powerful emotions like anger can be channeled in constructive ways. Liminal time is also an opportunity for reflection. What led to the meltdown and why? What can we do to bring forth the best outcomes? 3. Return– when the crisis passes, there is a return to a new level of equilibrium. If the process goes well we will have returned from what mythologist Joseph Campbell called a Hero’s Journey with precious gifts to give to family, community, nation, and the planet. “There is a skill set that resilient people draw upon in liminal times,” writes Joan. Described as a short and easy to read book: It’s not the End of the World: Developing Resilience in Times of Change is on my reading list for 2017.